I watched the water freeze in the yard! And listened to the wind howl around the house. They said it would be gusting to 5o mph and I think it may have. At least this year my house didn't move with the gusting. I have a doublewide mobile home I placed on a foundation this past summer and it is much more stable and the floors are much warmer. 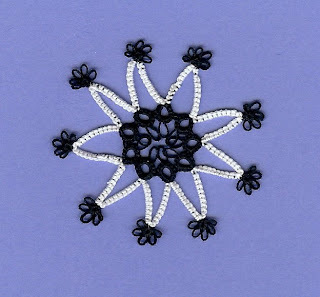 I did this black and white snowflake. I guess I am not done with them yet. I don't have any colors that I want to use to make baby booties so I placed an order with Be-Stitched. I am going to order some of the new Lisbeth threads from HH when it is in. I seem to be building up a supply of threads. It must be an addiction! I talked to my daughter in Alaska and she had her first bout with morning sickness. She has a couple of old remedies to try out to help with that. She is just such a naturalist any home remedies would be just right for her. Her hand is healing nicely but is now itchy. She keeps it covered to avoid any infections and that also helps to control the scratching and digging. Her weather, just so you can shiver was -32 when I talked to her earlier. Oh, I feel your pain about today's weather. It was near 60 down here yesterday, now 38, and it sounds like the wind is going to tear the roof off! Spring will not come fast enough for me. Just reading the words 'Alaska' and '-32' make me want to cry. The snowflake looks good! My thread stash is beginning to run low. I think it's time to go shopping. I want to try some of that Lizbeth thread myself.